A large breakfast that includes whey protein may help control Type 2 diabetes, according to a new study presented at ENDO 2016, the annual meeting of the Endocrine Society. Approximately 29 million people in the United States have Type 2 diabetes, and another 86 million are living with prediabetes. Previous research has indicated that a large, high-protein breakfast, medium-sized lunch, and small dinner can help manage blood sugar levels and weight in people with Type 2 diabetes. To evaluate whether eating whey protein (a milk byproduct created during cheese production) at breakfast is more effective than eating other proteins for controlling blood sugar, HbA1c (a measure of blood sugar control over the previous 2–3 months), weight, and hunger, the researchers recruited 48 overweight and obese people with Type 2 diabetes. The participants, who had an average age of 59, were randomly assigned to one of three diets containing the same amount of calories for 23 months. The only differences between the diets were in the amount and and type of proteins included at breakfast: The first group ate breakfasts containing 42 grams of 80% whey protein concentrate, such as whey-based shakes; the second group ate breakfasts containing 42 grams of non-whey proteins such as eggs, tuna, and soy; and the third group ate high-carb breakfasts with on 17 grams of protein. 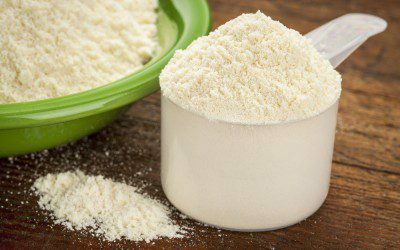 After 12 weeks, the whey protein group had lost an average of 16.7 pounds, compared to 13.4 pounds for those eating other proteins and 6.8 pounds for those eating primarily carbohydrate. Participants eating whey protein also felt less hungry throughout the day, had lower post-meal blood sugar spikes, and had larger decreases in HbA1c compared to those on the other two diets. She added that whey protein is not a meal substitute, but rather that the whey protein shake should replace other proteins typically eaten at breakfast. For more information, see the article “Large Whey Protein Breakfast May Help Manage Type 2 Diabetes” or the study’s abstract on the ENDO 2016 website. And to learn more about controlling high blood sugar, read “Managing Hyperglycemia” by certified diabetes educators Laura Hieronymus and Belinda O’Connell.